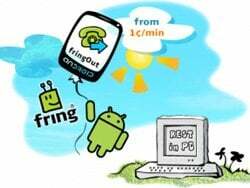 Two weeks after releasing fringOut that enables users to make cheap calls to any regular landline or mobile phone anywhere in the world, with rates as low as 1¢ a minute, fring announced the service is now available for Android phones. fring’s new service is currently available also for Nokia S60 (Symbian) devices and will soon be available on iPhone. fringOut’s rates for Germany, US, UK and India starts at 1¢. fring users will still be able to use other SIP service through fring (“We are sure you’ll love fringOut’s simplicity and its low prices. If for some reason, you still want to use other SIP providers, you are welcome too,” the company said). All the other fring features, like fring to fring calls (audio and video) are still available for free. The option to send an sms using fringOut credit is currently not available.